Show off your gorgeous pet in these fashionable sequin, shiny sumptuous, and velvet fabric collars that are available in the Classy collection. 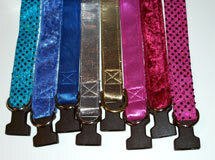 Every collar features quality nickel plated or brass hardware. These are available in all sizes. *Small Prints - More suitable for smaller collars - Guidelines only. *Please note: Fabric prints that the pattern appears to be larger may not be appropriate size for smaller collars, especially the X-Small and cat collars. The fabric samples are shown wider (the actual measurement would be 1 1/2" to 2" wide - or twice the width of a large collar - on samples shown) than actual width of a collar in order to show variation of the print. Please take this into consideration when ordering. We can not accept returns for this. The images of the sequin,sparkle, shiny and dazzle fabrics do not show their true brilliance. *Guarantee: CANINE COLLARS guarantees our products against any flaws in materials or workmanship. CANINE COLLARS products are not guaranteed against excessive scratching, chewing and pulling. Also, keep in mind that these fabrics are more fragile to abuse than others. They may need to be removed from pet to prevent excessive scratching when not supervised. 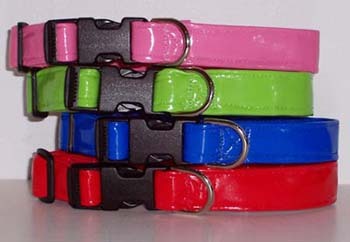 These collars are not suitable for pets that are tied out. Great for water (metal buckles are not reccomended though). Hot Pink Sparkle is swimwear fabric too!